The Trump Tax Reform reducing the corporate tax to 21% and taking effect January 1st, 2018 rather than being delayed until 2019, will be one of the biggest positive catalysts for US equities in decades. 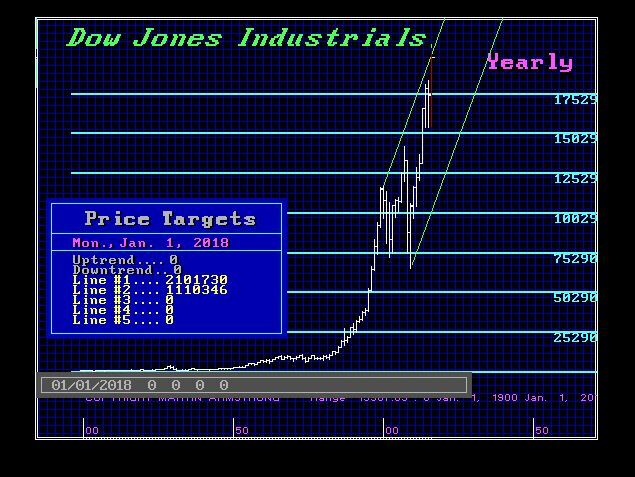 This is very interesting because it is now fundamentally validating what our computer has been projecting for highs going up to the 40,000 level on the Dow back in 2009. Many of the domestic and institutional investors overseas are NOT in this market. They will now be forced to reposition their portfolios once the bill is passed. How to Trade a Vertical Market is absolutely critical at this point in time. This is by no means going to be easy. We are already above the top of the Upward Channel and this will be 21,017.30. Our projections for 2017 stood at 25,648.40 and this rises to 28,045.71 for 2018. This is the next area of resistance. Once we push through that projection, the market will come back to test it. That will be the start of the slingshot upward. The same model produced the projection at 195.97 for 1928. The year 1928 opened above the projection at 203.40, fell back to retest it dropping to 194.50, and then entered the slingshot running to 301.60 intraday and closed that year at 300.00. Keep in mind our projection model gives us 25,648.40 so we are not yet through that level in 2017. This is why I have always warned AGAINST fundamental analysis. The fundamentals ALWAYS unfold to validate what our computer forecasts to start with. Our forecast that BREXIT would win and Trump back in 2016 was possible ONLY because the computer was picking up the change in public sentiment which is driven by economics. The Trump Tax Reform is a reflection of the discontent underlying the economy. The Democrats will naturally vote in block against it because they simply like the higher taxes even if it produces fewer jobs and lower economic growth. They cannot change their color now. NOBODY could have forecast this back in 2009. Barron’s though we were crazy back in 2011 forecasting the Dow was off to new record highs. Socrates can beat anyone, even me. So why will mainstream media not report our model’s success? Because it is not in the self-interest of themselves or government. Why interview people with opinions to fill their pages if all you have to do is try to figure out why the forecasts Socrates puts out will unfold on schedule? Don’t worry about it. Our big clients prefer that our forecasts are not on their front pages. After the New Year, we will produce a special report on the US share market for 2018 with the turning point and price objectives for the year.